Images supplied by Parliamentary Archives. As it turned out, Albert Goodwill Spalding (1850-), was appropriately named by his parents. For it was in a successful action by his firm of sporting goods makers that the House of Lords established that the law of passing off was based on goodwill rather than on any property in the mark (as had been mooted from the 1860s). Born in Byron, Illinois, Spalding was a successful baseball player, who in 1876 started a shop in Chicago making and selling baseballs and other baseball equipment. The business was a huge success, expanding in 1885 to New York (where a current shop remains at 520 Fifth Avenue, though there is much less emphasis today on sportswear). Spalding’s was heavily involved in innovating in the field, and held a large number of patents. Today, Spalding in widely recognised as the maker of basketballs. The case concerned Spalding’s footballs. 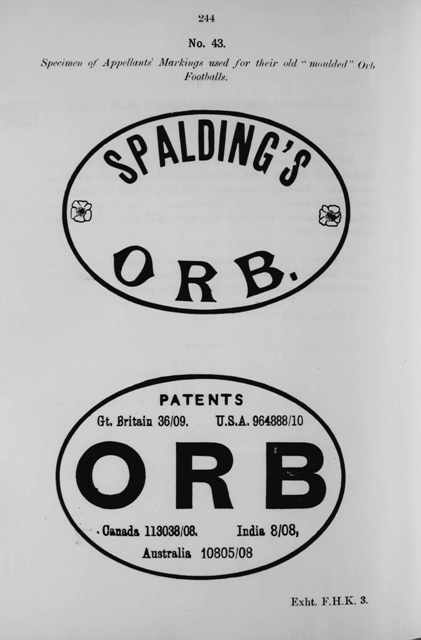 Between 1910 and 1911, Spalding had made moulded footballs, made out of vulcanized India rubber, which it sold under the name “ORB” (and a reference to ‘Patent No 36). 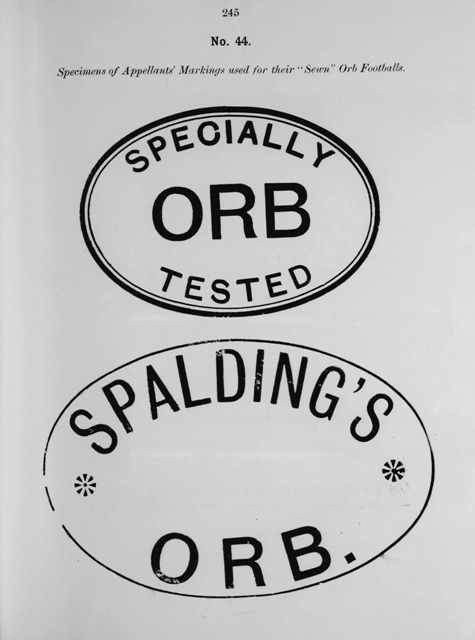 (The first image below is from Spalding’s 1911 catalogue advertising the ORB). 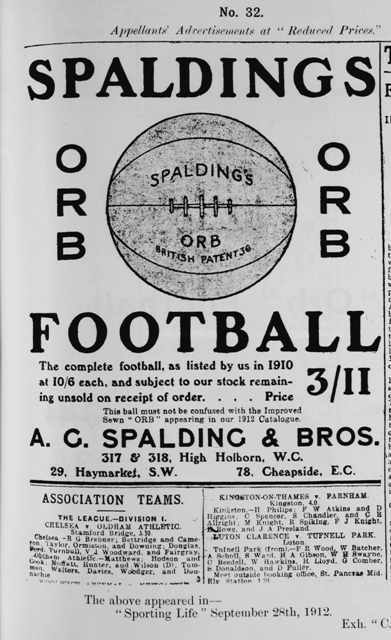 Spalding became dissatisfied with the performance of the footballs, in particular because they were too heavy, and decided to stop making them and replace the Orb with a new range of footballs (30 RPC 396). The new footballs were not moulded but instead made from canvas and rubber, and sewn together. 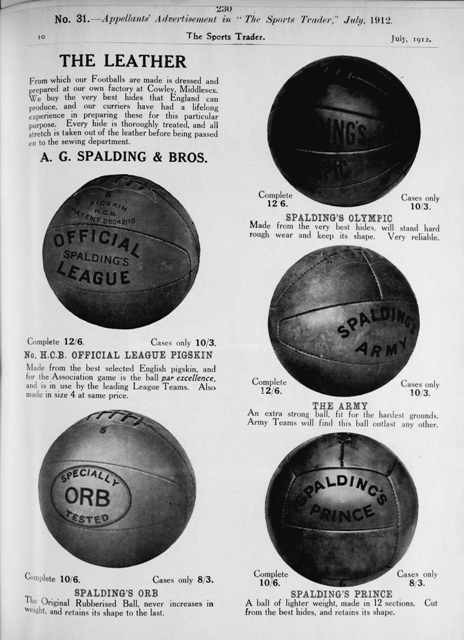 Spalding’s had obtained a patent, No 15163 (the catalogue contained the wrong number), for the new ball. 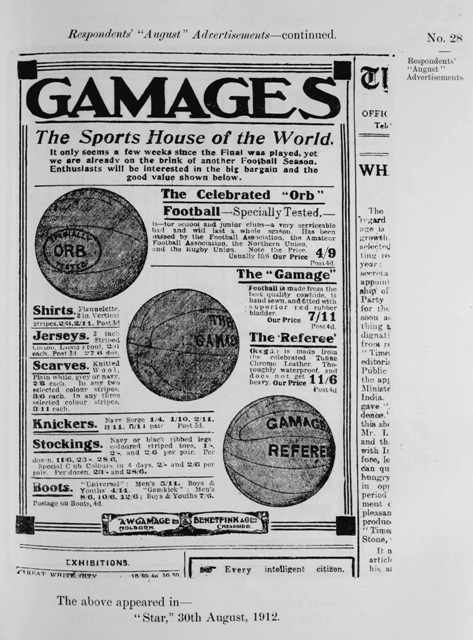 Therefore, in April 1912, it sold around 5,000 balls to a rubber waste merchant, Mellis, Schein and Co (for 4 d each), though apparently without requiring that the balls be destroyed. 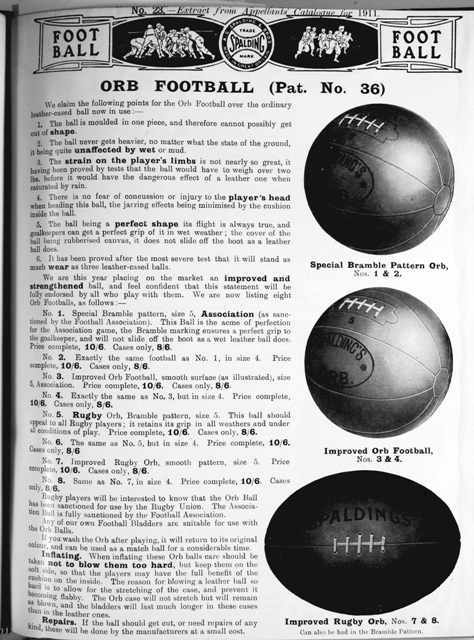 Spalding’s called the new range of sewn footballs “IMPROVED SEWN ORB FOOTBALL” and advertised them in their catalogue as “ORB Specially tested.” The 1912 catalogue is the second image depicted below. 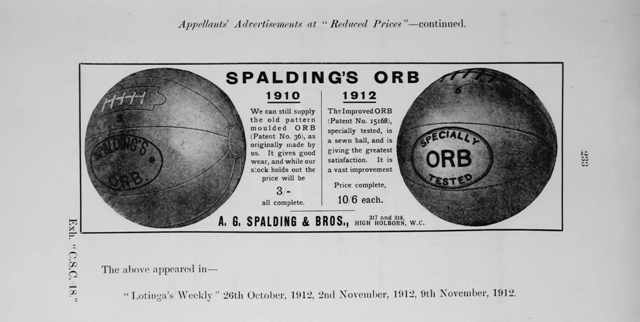 However, as is clear from the images from The Sports Trader, July 1912, and Lotinga’s Weekly, for October and November 1912, also depicted below, Spalding continued to sell the original Orb at 3 shillings, alongside the “IMPROVED ORB Patent No 15168’ (at 10 sh and 6d). The defendant, operated a well-known department store in Holborn in London (which was in operation until 1972, by which time it was viewed as an “eccentric and rambling bazaar”(Phillip Howard, ‘Bargain Hunting in the Death Throes’, The Times, March 15, 172, p 5a). The shop was the brainchild of Albert Walter Gamage (1855-1930; obituary, The Times, Apr 7, 1930), who first started a hosiery shop in 1878. The business flourished, partly as a result of Gamage’s ability to identify and supply fashionable articles, such as hairbrushes and bicycles. By 1900, the shop floor was almost two acres in size. An image of its impressive ornate exterior from 1907 can be found here. It is said that Gamage’s “price cutting embroiled him with wholesalers. Frequent law-suits besieged his gates, and some manufacturers refused to supply him” (Howard, ibid). Certainly, this was not the first occasion on which Gamage’s had been on the receiving end of an action for infringing intellectual property: in 1904 it had fought an lost a case concerning infringement of both patents and registered designs in bicycles (Werner Motors Ltd v A W Gamage Ltd  1 Ch 264; 2 Ch 580 (CA)). 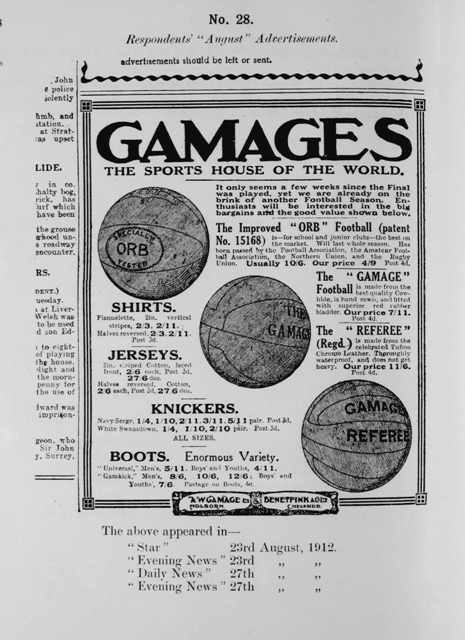 Indeed, Gamage had himself initiated at least one suit, unsuccessfully, claiming breach of contract by the owners of certain magazines who declined to include certain advertisements for Michelin tyres that Gamage had on sale at a lower price that Michelin’s: A W Gamage v Temple Press (The Times, June 15, 1911, p 3e; June 16, 1911, p. 3f; June 17, 1911, p. 3e). Charles Stewart Cox, from Spalding, conducted a trap purchase. He went to Gamage’s store and asked for an Orb football, and received an old moulded ball. He had a meeting with John Samuel Parker, one of Gamage’s directors. The latter indicated he would have it corrected if it were wrong. 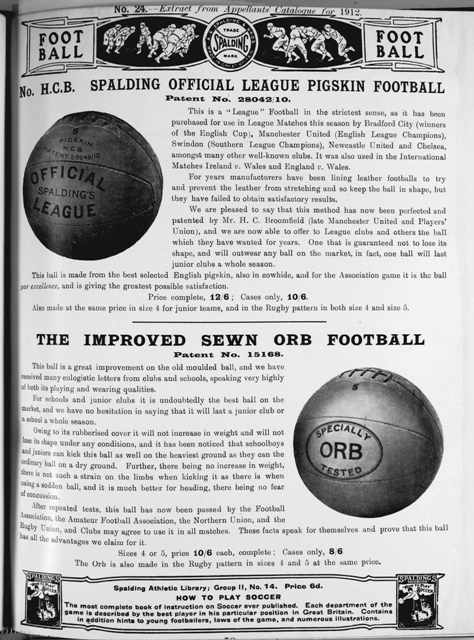 After investigating, Parker found that the advert prepared by Robert Glasspole while was on holiday contained a stupid mistake in referring to the ‘Improved Orb Football (Patent No 15,168). 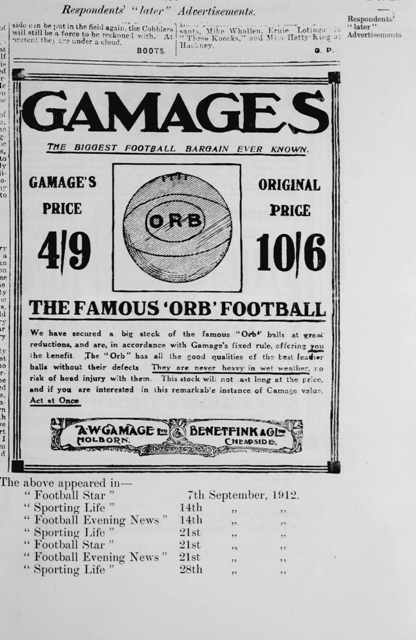 Despite this, Spalding issued a writ commencing proceedings issued on 30 August 1912), the Defendant asserted that this initial advert had been a mistake (written by the advertisement manager rather than Mr Parker, Gamage’s sports manager) and amended its advertising, but continued to sell the footballs as THE FAMOUS ‘ORB’ FOOTBALL. The later adverts are also depicted (as “No 29”). The writ sought injunctive relief restraining the Defendants (1) from selling, advertising, or offering for sale or supplying footballs under the name ‘Specially Tested Orb’, or under any name of which ‘Orb’ forms a part, and from in any way using or applying the word ‘Orb’ in respect of or to footballs in such a way as to pass off inferior footballs as and for the new ‘Orb’ footballs now sold by the Plaintiffs; and (2) restraining the Defendants from selling footballs ‘other than the Plaintiffs’ ‘Improved Orb’ or ‘Specially Tested Orb’ footballs as and for the Plaintiffs’ ‘Improved Orb’ or ‘Specially Tested Orb’ footballs. The breadth of the first part was soon recognised to be unjustified, and not pressed, but cast a shadow over proceedings (see eg 32 RPC 279). The High Court heard the case in May 1913. The proceedings are reported in The Times (May 6, 1913, p 4c; May 7, 1913, p 3a; May 8, 1913, p. 3f and in 30 RPC 388, 392-). Gamage was represented by Arthur James Walter KC (d. 1919), who was said to have “no equal in the conduct of patent cases” (Obituary, The Times, April 12, 1919 p. 10e; see Gilchrist Alexander, ‘The Patent Bar’, (Feb 15, 1947) 203 The Law Times 96 (“Walter was in practically every action of note”). Walter led Duncan Mackenzie Kerly (1863-1938; Obituary, The Times, Oct 6, 1938, p. 14e), the author of the famous treatise on trade marks (then in its 3rd, 1908 edition, co-authored with Frank George Underhay – a fourth edition would appear in 1913). Both were members of Inner Temple (Walter from 1885, Kerly from 1887, Kerly also then holding a fellowship at St John’s College, Cambridge, where he had won the Yorke Prize for his A History of Equity (1890)) and had worked together previously (eg in Outram v The London Evening Newspaper Co in 1911). Indeed, Walter and Kerly had represented Gamages in the litigation with Werner Motors in 1904, two years before he took silk in 1906. Walter opened, arguing that the case ought never to have been brought at all. It was a case of a simple mistake, and that once Gamages discovered the mistake, there was no further threat to Spalding’s interests. Counsel for Benetfink was Mark Lemon Romer KC (1866-1944). Like Martelli, Romer was a Chancery barrister and a regular before the courts of Parker J and, on his elevation, Sargant J. (In due course, he would himself be elevated to the High Court (in 1922), the Court of Appeal (1929) and the House of Lords (1938). The question of whether it was appropriate for Benetfink, who used the same solicitors as Gamage, to receive separate representation from counsel would be a matter of further litigation (Sargant J holding in 1914, and before the House of Lords decision in favour of the plaintiff, that such dual representation was appropriate because of the distinct positions of the two defendants:  2 Ch 405, (1914) 58 Sol Jo & W Rep 722). Romer KC argued forcefully that the litigation was unjustified, the claimants having “made donkeys of themselves” were now “crying stinking fish”. He asserted that there was nothing in the advertisements “which would mislead any sane human being on any point which was material”. The judge at first instance was Mr Justice Charles Henry Sargant (1856-1942), then newly appointed to the High Court (though having practiced in Chancery). Sargant J described to story as “a rather unpleasant one” (30 RPC 396), and granted the injunction sought and awarded an inquiry as to damages (The Times, May 9, 1913 p. 3b; (1913) 29 The Times Law Reports 541; 30 RPC 388). He remarked that “a trade must not sell goods, which are not those of a trader, rival or not, as being the goods of that trader, nor must he sell one class of goods of a rival trader as being another class, or superior class of goods of that trader” (30 RPC 388, 395) . 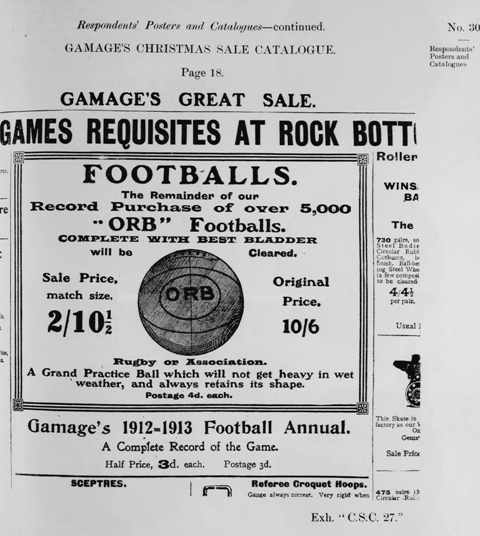 He awarded an injunction, forbidding the defendant from selling footballs other than those advertised in the September 1912 catalogue as and for the footballs there advertised (30 RPC 400). Gamages appealed. By the time of the appeal, in February 1914, Spalding’s lead counsel, Stanley Buckmaster, had been made Solicitor-General, and was no longer involved (he would become Lord Chancellor in 1915). 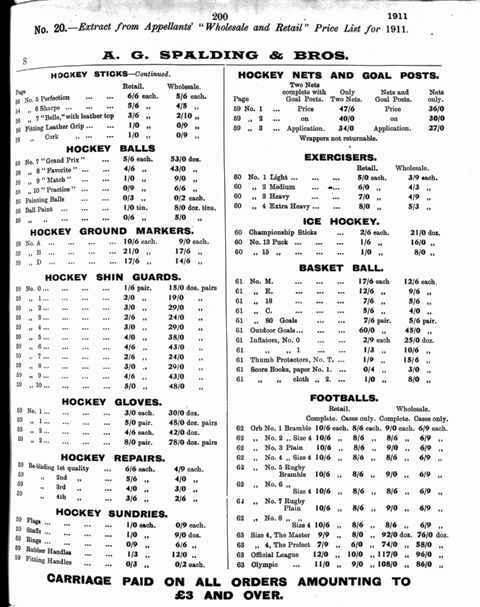 Martelli KC represented Spalding, and Walter KC and Kerly continued for Gamages. The Court of Appeal decision, reversing Sargant J’s conclusions is reported at (1914) 31 RPC 125. Giving the lead judgment, Cozens Hardy MR (1838-1920) agreed that an action for misrepresenting the class of a person’s goods could be maintained “under certain circumstances” (31 RPC 133) but not on the facts. 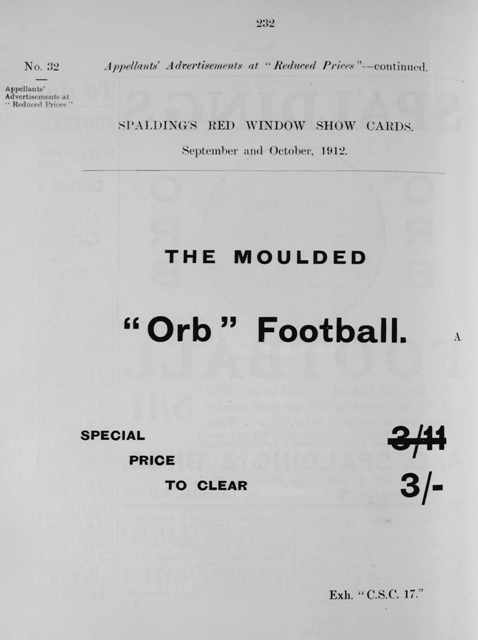 He highlighted that Spalding had in fact referred in 1910 to the moulded football as “Improved 1910 Orb Football” and “Improved Orb Football” (in the 1911 catalogue). Looking at the August advertisement he concluded that “with the single exception of the reference to Patent No 15,168, the description was accurate as applied to the balls they were offering for sale. They had been called “Improved Orb” and had been “Specially Tested”. There was no evidence that anyone attached special significance to the reference to the patent (31 RPC 134). The later adverts were completely innocuous. Buckley LJ (31 RPC 136-8) explained that while the initial advertisements were, and had been admitted to be wrongful, the September ones were unobjectionable. The suggestion that there was “a continuing aroma of misrepresentation”, was simply not proved. There was no evidence of persons purchasing balls in September as a result of the earlier mistaken representation. The injunction, as originally claimed, was misconceived, and as granted related to something which the defendants did not propose to do. (Walter GF) Phillimore LJ (1845-1929), who had only recently been elevated to the Court of Appeal likewise agreed that the initial advertisement amounted to passing off, but not with the conclusion drawn by Sargant J that such wrong continued to affect the later September advertisements. Spalding’s appealed to the House of Lords. Argument before Lords Haldane LC, Atkinson, Parker, Sumner and Parmoor took place on 5th and 9th February 1915. Spalding was now represented by Sir Robert Finlay KC (1842-), a senior Chancery practitioner who had entered politics, and had already held the posts of Solicitor General and Attorney General, but had thereafter continued to practice. The following year he – like Buckmaster before him - would be made Lord Chancellor. He emphasised that the later adverts compounded the earlier misrepresentation. Gamages’ team of Walter and Kerly was unchanged. Judgment, allowing the appeal, followed on March 23, 1915. The Lord Chancellor, Lord Haldane, who was to leave the post in May 1915 did not participate. Lord (Robert John) Parker (Baron Parker of Waddington, 1857-1918), gave the lead judgment. Lord Parker was elevated (directly from the High Court) to the Lords in 1913. He was referred to as ‘the greatest master of equity of our generation’ (RFV Heuston’s ODNB entry for Mark Romer), but more relevantly had significant experience, both as practitioner and as judge, in what we now refer to as ‘intellectual property.’ In the early years of the century he frequently appeared on behalf of the Comptroller in trade mark cases– including the “tabloid” case, also featured in the Virtual Museum - when he had sometimes been led by Robert Finlay, who had put the case for Spalding. As a judge he had given decisions in patent (for example giving judgment at first instance in Poulton v Adjustable Cover), designs (Pugh v Riley Cycle), copyright and trade mark (for example, the ‘gramophone case’) matters from his appointment to the Chancery Division in 1906. He had, in fact, also given a number of decisions in passing off cases, most notably British Vacuum Cleaner  2 Ch 312, Burberry’s v JC Cording & Co Ltd (1909) 26 RPC 693, where he had already stated that passing off was an action that would protect property in goodwill rather than in the mark itself (at 701). Looking at the facts of the case, Lord Parker emphasised the similarities between the defendants’ advertisements, even after August, and the plaintiff’s August 1912 catalogue. 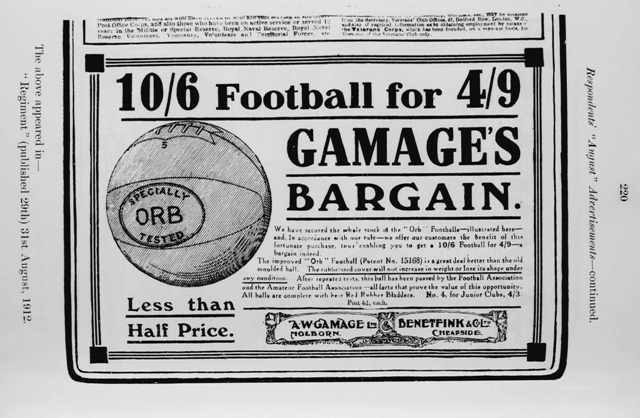 This was not just a question of words, but also using identical images of the balls, bearing the words ‘specially tested Orb.’ Anyone comparing them, or having knowledge of the catalogue, would be led to believe the defendants were selling at less than half price the very ball advertised in the 1912 catalogue (286). The question was not whether individual statements were true but whether the advertisements as a whole were calculated to deceive. He thought they were, and that, this being a matter for the judge, this was a matter that he was in a position to determine. In any case, the proceedings revealed evidence of actual deceit – one of Spalding’s customers had complained that they had sold balls to Gamages at a wholesale price lower than that which they had been offered (287). Lord Parker disagreed with the suggestion that the action should not have been brought, and with the view that the later advertisements were innocent. Indeed he agreed with Finlay KC suggestion that the later advertisements compounded, rather than neutralised the wrong. Lords Atkinson, Sumner, Parmoor indicated their agreement with Lord Parker. Lord Atkinson had nothing to add. Lord Sumner gave a speech in very similar terms, emphasising the significance of the overall impression conveyed, and the failure to prevent the initial impression from continuing. “Though [the defendants] were careful to do no new mischief”, he explained, “they left the old mischief to work.” (289) Lord Parmoor (aka Charles Alfred Cripps, 1852-1941), who had been appointed to the House of Lords in 1914, also gave a short speech, with similar reasoning. In the end, then, Spalding succeeded. 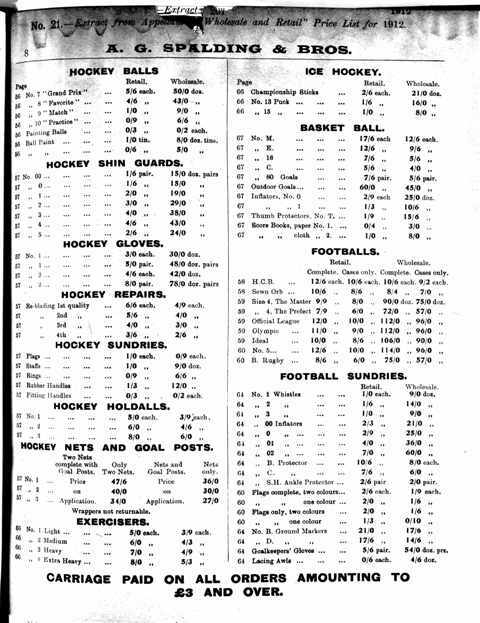 However, Spalding’s success was not as great as may first appear. In the damages inquiry that followed, it asked for £18000 damages for lost sales and £2000 for loss of reputation. 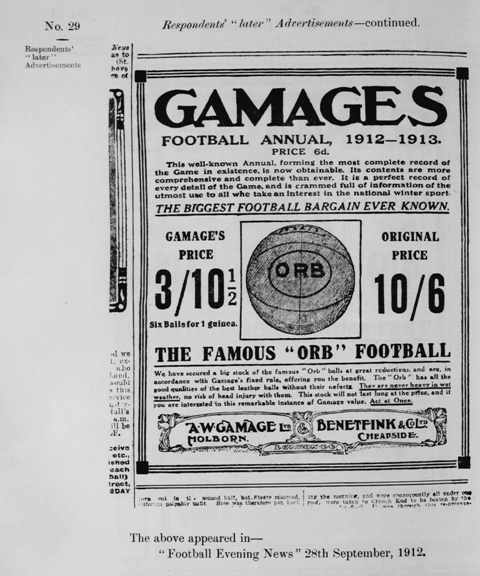 It was initially awarded £7000 by the Official Referee, but Gamages successfully appealed, Younger J replacing it with an award of a mere £100 (The Times, July 12, 1917, p. 2a; 34 RPC 289). On appeal, the Court of Appeal raised the figure to £250: The Times, March 21, 1918, p. 4b; 35 RPC 101). The case may have become a significant one in legal terms, but for Spalding it must have been, ultimately, a rather unsatisfactory affair. The previous case-law has been quite thoroughly reviewed by Ian Tregoning (‘What’s in a Name? Goodwill in Early Passing Off Cases’, (2008) 34 Monash U LR 75). The re-orientation of the action as based on goodwill, of course, proved to be highly significant. On the one hand, it allowed for the expansion of the action. Had the action been based on property in the mark, it would have been difficult to imagine that such a property would have been permitted to extend to the range of misrepresentations that it now encompasses.